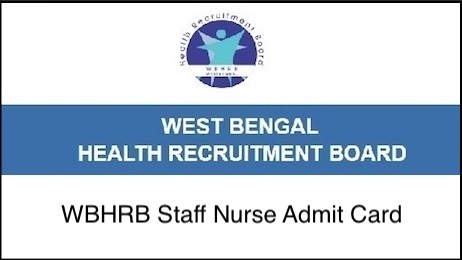 WBHRB Staff nurse Exam Hall Ticket 2018: West Bengal Health Recruitment Board (WBHRB) is set to organize the Staff Nurse Grade II written test in the month of September. The competition is on a higher note for WBHRB Staff Nurse (Grade II) posts in the state of West Bengal. The WBHRB Staff Nurse examination will be held in various examination centers across the state. Aspirants who had already applied for the Staff Nurse posts will have to appear for the written test in their allotted examination center. Before attending this examination, candidates must have to download WBHRB Staff Nurse Grade II admit card/hall ticket to attend the test. Aspirants will not have allowed to participate in the examination without showing the admit card. Hence without fail all the hopefuls must carry the admit cards while going to the examination. Get the WBHRB Staff Nurse Hall Ticket from the official website, wbhrb.in and take a printout to carry it to the examination. More guidelines about WBHRB Staff Nurse hall ticket, hall ticket release date, and other information is specified in this article. West Bengal Health Recruitment Board (WBHRB) handles the recruitment process of various government associated organizations. Annually the West Bengal Health Recruitment Board issues various job notifications for the health department of the state. It hires the suitable aspirants by conducting the written test and interview rounds. Based on the merit of aspirants in the selection process it hires the aspirants for the announced posts. This year the WBHRB has announced 4976 Staff Nurse Grade II posts. The application process was carried out in the month of July. Hence the WBHRB announced a large number of posts, many of the eligible aspirants have applied for the WBHRB Staff Nurse posts this year. The competition is going to be tough for the applicants. So, focus more to get good merit in the exam and interview rounds. West Bengal Health Recruitment Board is going to activate the hall ticket/admit card link on its official website, wbhrb.in. Aspirants applied for the staff nurse posts in the state of West Bengal can get their admit cards before 10 days of the examination. Candidates can find the hall ticket download link before the examination only. So, wait until the WBHRB releases the admit card. The competitors who are going to clash for the written test round have to download WBHRB Staff Nurse Hall ticket 2018 to appear for the test. To appear for this test candidates must download WBHRB Staff Nurse admit card inevitably. After downloading the hall ticket, candidates can check the details of Examination venue, date and timings of the examination from it. Candidates can also check their name, signature, scanned picture, date of birth and other details printed on admit cards. Candidates can go through the instructions for the examination from it. Candidates must never forget to carry the admit card while going for the test. The hall ticket checking will be done at the examination hall and candidates those who do not show their hall tickets will not be allowed to appear for the test. How to Download WBHRB Staff Nurse Grade II Hall Ticket Online? Enter Registration ID and Date of Birth or other required details. The West Bengal Staff Nurse Admit Card will be downloaded on the screen. Keep it safe in a folder and do not forget to take the admit card while going to the examination.